St. John Kanty Church - Buffalo, NY > News > News > Buy a Shirt or Hoodie and Help SJK This Easter Season! Buy a Shirt or Hoodie and Help SJK This Easter Season! East Buffalo’s Historic Polonia churches are the epicenter of Polish culture in Western New York. They struggle paying their bills…especially during the winter season. After Chris Byrd (a grad of our school and organizer of the popular website Broadway Fillmore Alive who played a key role in both the Alumni Reunion and the Mary Project) read a Buffalo News story about how the winter has impacted the finances of our neighborhood churches, a light bulb went off in his head…he decided to start a t-shirt fundraiser! 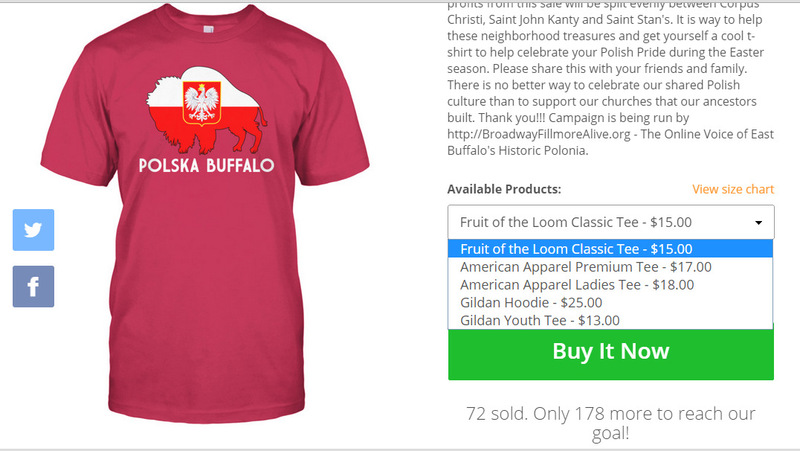 The Easter season brings out the Polish Pride in everyone…the shirt features a buffalo with Polish colors and has the words “Polska Buffalo” under it. You can also purchase a hoodie if you want and get the items in different colors. The proceeds from this sale will be split evenly between Corpus Christi, Saint John Kanty/Saint Adalbert’s and Saint Stan’s. It is a way to help these neighborhood treasures and get yourself a cool t-shirt to help celebrate your Polish Pride during the Easter season and on Dyngus Day. The goal is to sell 250 items and raise about $3000. Any amount raised will be a help! The t-shirt campaign will end March 22. This will ensure that you will receive your shirt during Holy Week. There is no better way to celebrate our shared Polish culture than to support the churches our ancestors built. Please share this with your friends and family.